When it comes to Chipotle’s stock, is it time for investors to be greedy when others are fearful? I think so. Not long ago, Chipotle Mexican Grill (NYSE:CMG) was a stock market darling. Investors believed the sky was the limit. No price was too high for the popular burrito-slinger. But that's no longer the case. Multiple food borne illness outbreaks at Chipotle's locations at the end of last year and the beginning of this year triggered an abrupt change in sentiment. Now, it's rare to come across a positive headline that touts the chain's likelihood of ever regaining its former glory. And it's not just analysts and commentators who are down on the burrito chain's stock -- investors are too. You can see this in the percent of Chipotle's outstanding common stock that's sold short. One in five of its shares, or 20%, have been borrowed by short-sellers who are betting on its decline, making Chipotle the most shorted stock among its close competitors. It's worth pointing out, of course, that Chipotle isn't the only popular food chain that investors are betting against right now. As you can see, 19% of outstanding shares at Noodles & Co. are short, too. And 16% of Panera Bread's are currently short. This at first seems to suggest that investors aren't betting against Chipotle because of past food safety issues, but rather because they're simply betting against the entire sector. One reason this may be the case, as my colleague Brian Stoffel notes here, is that the level of competition in the fast casual space is increasing daily. Analysts and commentators on Twitter have said the same thing. Yet, if you look at the trend in Chipotle's short interest over time, a different picture emerges. As you can see below, the figure rapidly increased in the fourth quarter of 2015, which corresponds with the first of the company's food safety issues to come to light. 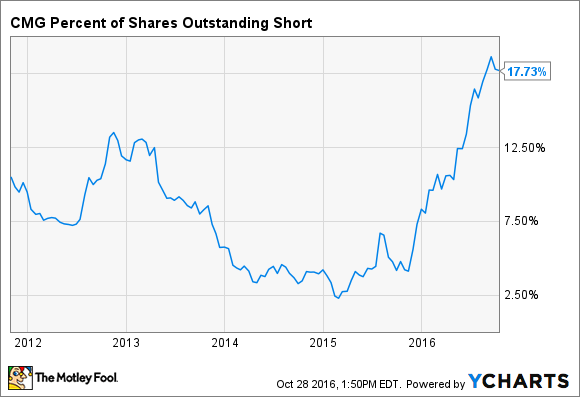 CMG Percent of Shares Outstanding Short data by YCharts. It's hard to say exactly how to reconcile these two points. On the one hand, it seems that investors are betting against Chipotle because of its specific problems. On the other hand, it seems that investors are betting against Chipotle because of problems it shares with other fast casual food chains. Or, perhaps it's a combination of both. Given the severity of the drop in Chipotle's stock over the past year -- it's lost half its market value -- this seems most likely. Either way, what's important for enterprising investors to keep in mind is that most investors make decisions based on emotions. And in times like this, it's far too tempting to allow the emotion of fear to take over, causing you to either sell you shares of Chipotle or avoid buying them after they've lost half their value in just over a year. As a Chipotle shareholder (I bought after the food safety issues came to light), my thesis is twofold. First, the quality of its food has returned to its pre-crisis quality. And second, as Warren Buffett famously says, the best way to make money on stocks is to go against the grain -- to be greedy when others are fearful. I believe that this presents a textbook application of the Oracle of Omaha's point.